Whether you’re a casual home user or an enthusiastic media fiend 13 New Netflix Originals You'll Be Watching in 2016 13 New Netflix Originals You'll Be Watching in 2016 Netflix has released a lot of original content -- including House of Cards, Orange Is the New Black, Narcos, and Master of None -- but 2016 is slated to be Netflix's most exciting year yet. 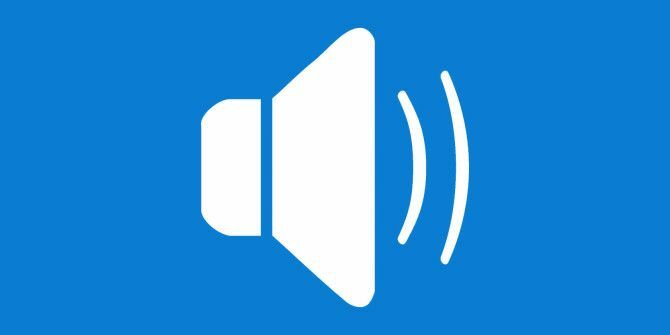 Read More , you might find that volume control can be a bit tricky on your computer. One app might be too loud while another might be too quite, and normalizing isn’t always the easiest thing. Most people aren’t aware that the operating system offers a way to change volume on a per-app basis. In fact, if you’re on Windows 10, there are two methods you can use — and both are incredibly simple. The first method involves no third-party apps. Just right-click on the volume icon in the system tray at the bottom right corner of your screen, then select Open Volume Mixer. A window pops up with separate volume controls for each app that’s capable of producing sound. The second method involves a third-party app called Ear Trumpet. Simply download it, install it, and run it. Afterwards, you’ll see an Ear Trumpet icon in the system tray at the bottom right corner of your screen. Click on it and you’ll see separate volume controls for all active apps. I prefer this second method because it looks nicer and it’s easier to invoke. It’s the little things about Windows 10 10 Surprising Reasons Why You Will Like Windows 10 10 Surprising Reasons Why You Will Like Windows 10 It's almost cool to hate on Windows 10 these days. Don't let that deprive you of all the benefits Windows 10 will bring! We show you what you're missing out on. Read More that improve the user experience, such as these lesser-known Task Manager tricks 10 Windows Task Manager Tricks You Didn't Know 10 Windows Task Manager Tricks You Didn't Know If the only time you open the Task Manager is when an application is frozen and needs to be killed, you're overlooking some of its more powerful features. Read More . Still wondering if you should make the upgrade? These are just a few of the many compelling reasons to get Windows 10 10 Compelling Reasons to Upgrade to Windows 10 10 Compelling Reasons to Upgrade to Windows 10 Windows 10 is coming on July 29. Is it worth upgrading for free? If you are looking forward to Cortana, state of the art gaming, or better support for hybrid devices - yes, definitely! And... Read More . Got any other Windows 10 tricks that you think we should know about? Share your knowledge with us down in the comments! Explore more about: Media Player, Windows 10, Windows Tricks. I got a call after 10:30pm last night. Woman had an Indian accent, said she was with the technical dept with Windows. Told her it was too late for me to be concerned with this, argued with her as she said it was very important, hung up on her. Caller id shows 980-949-6535, Gaines, Nyasia. She had my name, which ticked me off even more. This also works in Vista, 7, 8, and 8.1, FYI.